The hike up Mt. Elden is, quite simply, my favorite Flagstaff hike. Starting at 6,900 feet, about a quarter mile past the Flagstaff Mall on Highway 89, Mt. Elden is my neighborhood mountain and a great introduction to Flagstaff hiking or, if you’re so inclined, mountain biking. But beware; this is not an easy hike by any means. You will go up nearly 3,000 feet and three miles before reaching the peak. 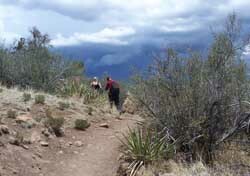 This is the hike I like to take visiting friends on if they are in good shape and the altitude is not bothering them. If they are not in the best of shape, there is a turn off at about a quarter mile to the Fatman’s Loop trail. You can’t miss the sign. This is a loop with little climbing that takes between 60 and 90 minutes. If you take the Loop turnoff at the sign, you will wind your away around oak, Ponderosa Pines, pinon, fur and alligator bark junipers, through boulder fields, including one really cool squeeze between boulders, and end up at the Mt. Elden Lookout Trail junction. Head down from there, on the Mt. Elden Trail, to the parking lot. Or, rather than turning off at the Loop sign, take the Mt. Elden Trail up to Lookout Trail/Fatman’s Loop junction and continue through “corduroy cast in stone” and a “staircase of petrified lava,” as Cosmic Ray describes them in his indispensable 50 Favorite Hikes - Flagstaff Sedona, which you can find at bookstores and coffee shops throughout Flag. Recently friends who live below sea level in The Netherlands visited, and we hiked my neighborhood mountain. Some hikers don’t like this trail, because you never really escape the sounds of the city below. My Dutch friends were in awe with the spectacular views. There is certainly nothing like this in their country. Bringing enough water and salty snacks (always bring water and snacks! ), we arrived at the trial head at about 7 am, looked to skies and saw what threatened to be a thunderstorm. You do not want to be climbing up high during a Northern Arizona summer storm. It can be extremely dangerous. So, keeping our eyes on the clouds, we hiked up the Elden Trail, deciding to come down Fatman’s Loop if, indeed, the storm rolled in. We were lucky; it didn’t. And some ninety minutes later, we reached the top, just past the area that had been devastated in a 1978 and up to where we could see the San Francisco Peaks, the city of Flagstaff, Sunset Crater and the Painted Desert. 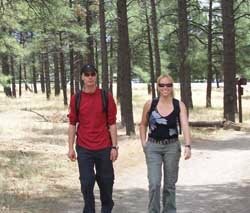 If you’re coming to Flagstaff, it’s a hike you won’t want to miss! Book all your hotel reservations here on Flagstaff.Cc. 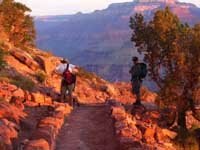 I recently did a one-day Grand Canyon one-day, 21.4 mile rim-to-rim hike. My hiking buddies, and I hiked from the south rim to the north rim. This is not a hike to take lightly. I’ve heard it said that a hike from the south rim to the Colorado River and back up to the rim in one day is the equivalent of a marathon run, yet many people approach such an endeavor as if it’s a walk in the park. The rim-to-rim is even tougher. I train before taking a hike of this difficulty. I work out either using aerobic machines or weights a couple of times a week and hike twice a week as well. 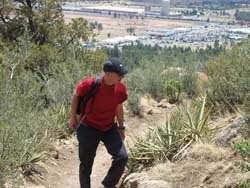 As the long hike approaches, I step up my regimen, so in the weeks immediately preceding the rim-to-rim, I hiked three times a week, including one 17-mile hike. Since we were hiking in early September one of our greatest concerns was the heat at the bottom. A Canyon hike begins at about 7,000 feet, and the temperature can be a good thirty degrees warmer at 2,400 feet at the Colorado River. So we started hiking down the South Kaibab Trail before dawn and reached the river by 9:00, so that we were on our way up by 10:00. There is no water on the South Kaibab. At the Colorado River is Phantom Ranch, a small lodge and canteen. You need reservations well in advance for a room or a meal at the canteen, but at most times of the day, you can stop there for a cup of coffee, lemonade and snacks. And you can fill up your water bottles as well. This was our first time up the North Kaibab Trail. There is little elevation change for the first six or so miles to Cottonwood Campground, which is the last chance to get water before a long steep climb. There is water again. The campground is closed during winter months. In fact the entire north rim is closed in the winter and accessible only to experienced cross country skiers. From the Cottonwood Campground you hike 6.8 miles and over 4,000 feet to reach the North Kaibab trailhead, which we got to after some twelve hours. Actually one of our party (the kid in the group who is only in his mid 40s) took about eleven hours for the full trip. In addition to being well trained, making sure you have enough water and snacks for adequate hydration, I recommend trying to have someone pick you up at the trailhead. For us, we had to walk another 1.5 miles to reach the North Rim Grand Lodge where we had dinner reservations and a cabin for the night. Again, always take a Grand Canyon hike seriously. We were very lucky with the weather. The day before we hiked there was lightning and severe thunderstorms. The morning after the hike, waiting to catch a shuttle back to the South Rim, where we’d parked our car, there was a massive hail storm, leaving the area look like winter.